The week of hubby’s birthday continued today with another cake and another celebration. I used Sweetapolita’s cake recipe and also her cream cheese frosting recipe. The only change I made to the cake was I used gluten-free flour. Honestly, no one would have had any idea it was gluten-free if I’d not mentioned it. Carrot cake seems to handle gluten-free flour well in taste and texture – I’ve made gluten-free carrot cupcakes once before with a different recipe. I baked the cake in two round pans, then sliced each cake in half horizontally. 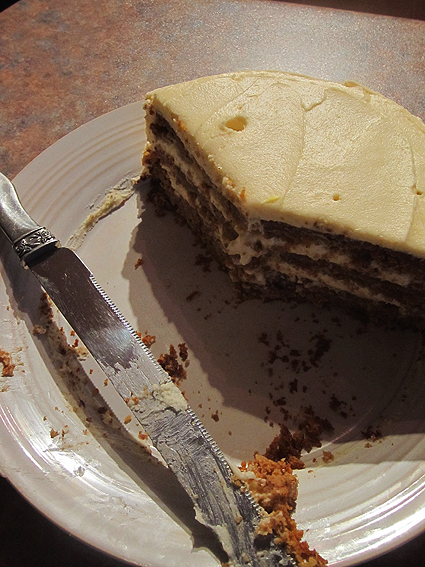 I assembled the cake with three layers and we taste-tested the remaining layer, just to be sure it was edible of course. The Hawaiian in the title refers to the pineapple in the cake. Having just come back from a week in Hawaii (when can we go again?) it seems as though if you stick pineapple on anything, bam, it’s Hawaiian! With this cold Sydney weather I’ll take a slice of Hawaii any chance I get. And yes, I’m in to layer cakes at the moment. I’m learning more about baking and decorating with each cake I make and really liking the look of layers of frosting sandwiched between soft, sweet cake. Happy birthday hubby! Also to cousin Ros who shares your birthday, and to cousin Joel who turned 10 on the 4th of July.